Summer is short in our part of the world but for me one of the joys of the season is climbing and hiking our local mountain ranges. Over the years I’ve summited all five of Washington’s volcanoes but another long-time goal I’ve had is to hike from Snoqualmie Pass to Stevens Pass. Weeks ago, finally, that goal was realized. This route is only a small portion of the 2600-mile border-to-border Pacific Crest Trail. 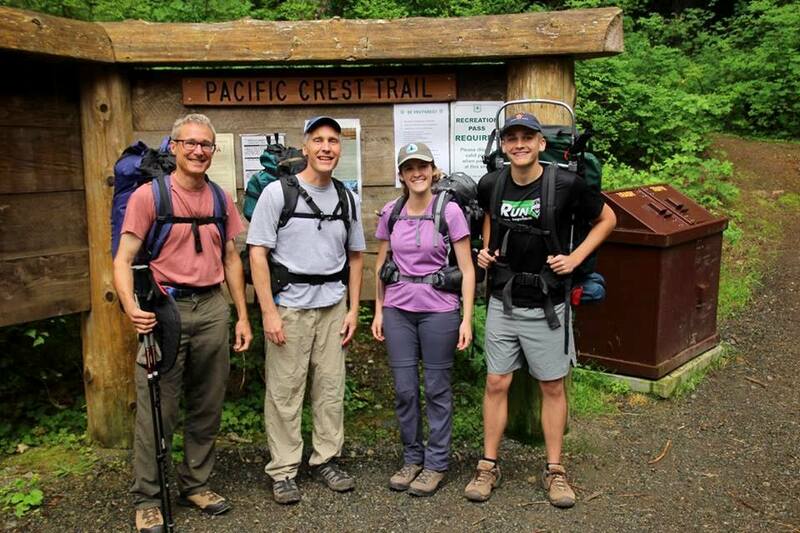 Also known as Washington Section J, this spectacular 71-mile stretch gains a total of 19,000 feet and loses a total of 18,000 ft. One of my Presbyterian pastor friends, his two children (ages 17 and 21) and I took five days to travel the distance. In the weeks leading up to this adventure we came across a book called Ultralight Backpackin’ Tips, in which the author describes a model ten-day hike for which a person can be fully equipped with a 25-lb. pack. That’s shelter, sleeping and cooking gear, clothing, food—everything! I was deeply skeptical that this was possible, even for a five-day hike; I was familiar with the more common pack weight of 40-50 lbs. Following the author’s strict guidelines, however, I did reach my 25-lb. target! How? One of my favorite examples: A backpacker’s camping stove, including fuel bottles, typically weighs two to three pounds. One lightweight alternative suggested in the book is an empty cat food can (this I procured from one of my cat-loving parishioners!). Modified to burn denatured alcohol, this “stove” weighs 2/10 of an ounce and worked flawlessly the whole trip! By ruthlessly cutting away unnecessary gear and designing creative alternatives for the essentials our challenging journey was much easier and more enjoyable! This experience reinforces the sage advice I heard years ago from one of my Mt. Rainier summit ascent guides, who warned: Ounces add up to pounds, and pounds add up to pain. There’s a life lesson in that. Especially when we’re stressed and fearful, the “small stuff” adds up fast. Soon everything in our lives can seem big and burdensome—like an expedition pack weighing us down. In Matthew, chapter 11, Jesus extends an invitation: Come to me, all you that are weary and are carrying heavy burdens, and I will give you rest. Take my yoke upon you, and learn from me; for I am gentle and humble in heart, and you will find rest for your souls. For my yoke is easy, and my burden is light. To follow Jesus certainly doesn’t mean that life gets easier! In fact, to become a disciple, he cautions, means “taking up your cross.” But what might it mean for Christians to wisely discern what’s essential for our life’s journey? The best “ultralight backpackin’ tips” from our scriptures likely have something to do with love. As we continue to move through this Pentecost season of discerning together what discipleship looks like, blessings on your journey!